Baseball leaders in Japan believe women’s baseball is still in the very early stages of a positive growth trend. TOKYO - Following the rise in the number of women’s baseball players in Japan—which has elevated the competition standards and fan-interest within Japan in the women’s baseball discipline, the newly organized “Women’s Baseball of Japan” (WBJ) was launched on April 1, 2014. The new overarching organization will now be responsible for overseeing entire categories of women’s baseball within Japan across the high school, university and club levels. Kazuo Hasegawa has been named WBJ’s first president. Hiroko Yamada, a member of IBAF’s Women’s Baseball Commission, has been named WBJ’s Secretary General, while IBAF Athletes Commission member, Megumi Kitta, has been appointed to the WBJ Executive Board. According to baseball officials in Japan, Hasegawa will be taking a cautious first approach to mapping out WBJ’s strategic-growth plan for women’s baseball in Japan, which is gaining in popularity. 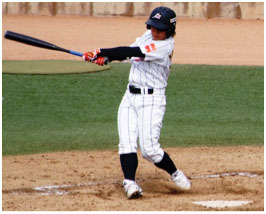 Japan’s women’s baseball program, “Madonna Japan”, is the topped ranked national program in the IBAF Women’s Baseball World Rankings, and the Madonna Japan are the three-time defending IBAF Women’s Baseball World Cup champions. Despite Japan’s growth and success in the women’s baseball discipline in recent years, Hasegawa still considers women’s baseball to be in the very early stages of a positive growth trend, and under his leadership, he is committed to providing women’s baseball his “total support” and will do everything possible to promote, develop and expand women’s baseball in Japan into maturity. --The Baseball Federation of Japan in Tokyo contributed to this article.